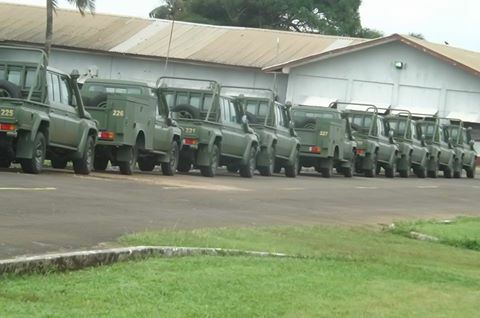 (LINA) – The United States Government has boosted Liberia’s international peacekeeping mission capacity with a donation of military equipment to the Armed Forces of Liberia (AFL). The equipment turned over Tuesday included 18 Land Cruiser Pick-ups, two Land Cruiser maintenance vehicles, two 24-foot Whaler Boats and one 44-foot container of spare parts. In remarks at the turnover ceremony held at the Barclay Training Center in Monrovia Tuesday, U.S Ambassador Christine Ann Elder recalled the long-standing ties between the two countries. At the same time, Ambassador Elder has disclosed that in order to support the AFL in its upcoming rotation of a contingent to the MINUSMA Peacekeeping Mission in Mali, the U.S is providing as a permanent donation a 10,000 litre water truck, a 50,000 litre/day water purification unit and a mobile kitchen trailer. She hoped that several of the newly-donated Land Cruiser pickups will also be deployed to Mali. The U.S. envoy recalled her country’s involvement in demobilizing the old AFL coupled with the recruiting, vetting, training and equipping of the new AFL which strength currently stands at about 2,000 men and women across the country. She lauded the country’s security forces for successfully taking over the security responsibility of the country from the UN Mission in Liberia peacekeepers. “Today reminds us of the enormous strides the AFL has made since its reconstitution in 2005 as it continues to professionalize its forces and to fulfill its mandate to more fully and ably serve and protect the public,” Elder emphasized. “The United States is proud to support the efforts of the Ministry of National Defense and the Armed Forces of Liberia with this equipment you see before you today, and I assure you that our support will continue in the future,” she stated. Earlier, President Ellen Johnson Sirleaf received the keys to the equipment and turned them over the Defence Minister Brownie Samukai. She lauded the Americans for their support to the Liberian from the start of the training of the new AFL to its development into a professional army. The U.S. government donation follows the donation of 22 military trucks, weapons and two motor graders by China to the AFL valued at US$3 million.